Book Corner: Half Sick of Shadows by Richard Abbott – History… the interesting bits! Today over at The Review, you can read my thoughts on Richard Abbott’s fantastic new historical fantasy novel, Half Sick of Shadows, a fabulous re-imagining of Alfred Lord Tennyson’s The Lady of Sahlott. And there’s a fabulous giveaway! With one signed paperback copy going to a winner in the UK, or and ebook to anywhere else in the world. There is one great advantage to being a book reviewer; every now and then you get to read a gem of a book, one that you may never have discovered had you relied on Amazon’s reading recommendations. Half Sick of Shadows is one such treasure. 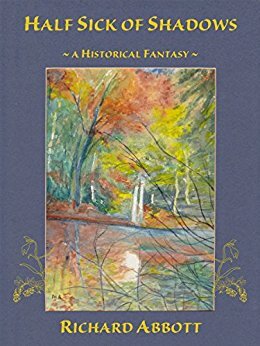 This novel, inspired by Alfred Lord Tennyson’s epic poem The Lady of Shalott, is unique and engrossing from the very first page. When trying to think of a single word that could be used to describe this novel, the only one that seemed to fit was ‘mesmerising‘. The reader is instantly drawn into the world of the Lady, who can watch the lives and interactions of the people in the world only through the guide of a mirror. She can see the world, but is apart from it, safe in her own keep…..